One of my ‘favorite’ brick walls (talk about an oxymoron!) is that of my great-great-great-grandfather Stillman Burr. He is reported born in Massachusetts circa 1797, married Zeruah Kenyon at Woodstock, Vermont in 1817, and is believed to have died sometime after 1870 – possibly at Henderson County, Illinois. 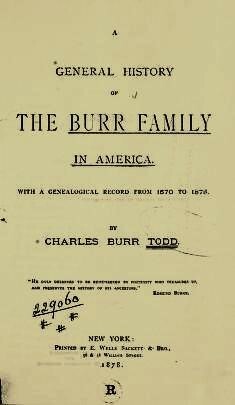 And yes, I’ve always been proud to have been a part of the Burr “clan” – no matter what bad “P.R.” might necessarily go along with the old name. But, hey, what the heck, right? None of this means that Stillman Burr isn’t still one of my favorite brick wall dudes from way back, right? After all, just because Stillman seems to have missed the final draft date for Todd’s book doesn’t mean that he doesn’t belong in it – or make my Grandmother Alta Sage’s ancestry any less a part of the Burr clan. It just means that one of my old fortress style brick walls stays that way. And you know, for the most part (at least for the last twenty-five years or so) I’ve been okay with that. After all, I’m probably not going to get to see Hamilton anyway. All this changed last week. 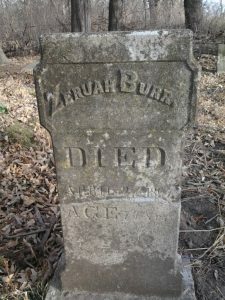 While hunting and pecking around the grounds surrounding my brick walls, specifically the one wall that is ‘Stillman Burr,’ I was prompted to inquire into a brief bio placed by another one of Stillman’s descendants on Findagrave.com. It wasn’t that the information posted was especially telling; it was more that the person posting seemed to have their own personal connection to Stillman. I had to know more. 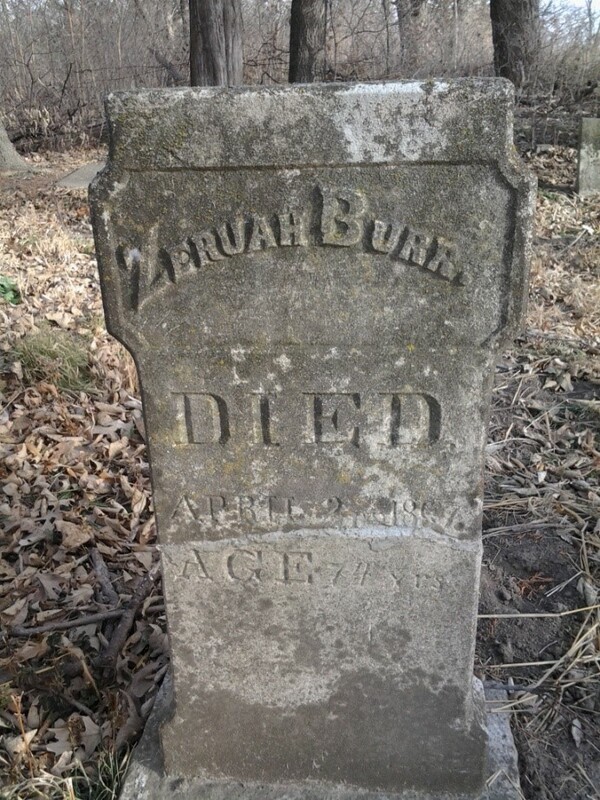 The grave of Stillman’s wife Zeruah Kenyon Burr (1793-1867) . My new cousin had already taken some of the necessary steps. He recently completed a 67 marker Y-DNA chromosome study in hopes of finding his own answers regarding Stillman Burr – his great-great-great-great-grandfather. And, the results are in – this fourth great grandson of Stillman Burr does not match anyone in the Burr data base. Instead the Y-DNA matches a Hedgepath family, one that may have gone no further north than New Jersey. Suddenly, one of my favorite old brick walls just came due for a DIY remodel. The questions are overwhelming to my staid knowledge of all things Burr. Does this mean that Stillman Burr was not a Burr? Does this mean that I have no Burr ancestry? Or, rather, are we faced with a previously-unknown non-parental event within the last 200 years? Where is the break in the chain? Is this the reason why Charles Burr Todd chose to omit Stillman and Zeruah Kenyon Burr from his work? So what was once old has become new again. It’s an exciting “un-find” and perhaps the best part of it all is connecting with a new cousin to help go down that road of discovery. As near as I can tell there is only one other living male descendant of Stillman Burr left on the planet (all daughtered out) besides my new cousin. I have high hopes that if we are able to connect with him that he too will be willing to help us solve the mystery of just who was Stillman Burr. U.S. Federal Census Records for 1850 and 1870 show Stillman Burr’s year of birth as 1797 and place of birth as Massachusetts. 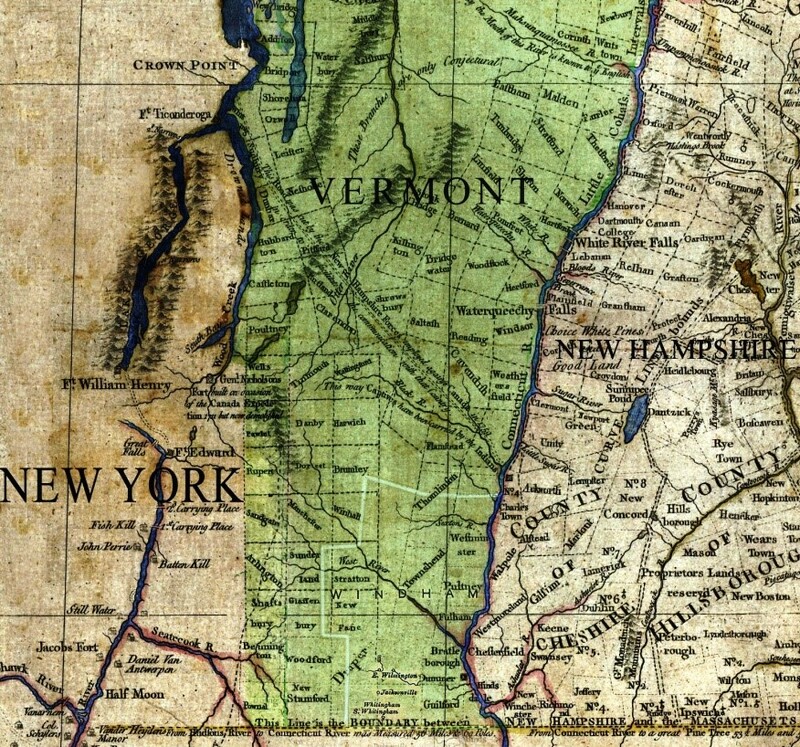 Vermont, Vital Records, 1720–1908, Ancestry.com, for marriage of Zeruah Kenyon to Stillman Burr on 25 December 1817 at Woodstock, Windsor County, Vermont; Stillman’s place of death is speculated and is based on the 1870 census. 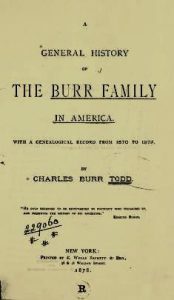 Charles Burr Todd, A General History of the Burr Family… (New York: Knickerbocker Press, 1902), lists a “Silliman Burr” whose wife and family is assigned to my Stillman Burr and his ancestry. The name “Stillman” appears no less than six times in Todd’s book, with the name “Silliman” appearing twenty-one times. Stillman’s daughter Maryann Burr Sage named her son “Jerome Spillman Burr,” ascribing a generational association with the name. Mary Ann Burr Sage (1821–1872), daughter of Stillman Burr and grandmother of Alta Sage Dixon. Findagrave.com memorial No. 175057405 for Stillman Burr and placed by Mikel A.T. Boyles 7 January 2017. 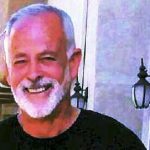 Email message to author regarding the surname “Hedgepeth, Hudspeth, or H*d*p*th” and the Y-DNA project connected to the work of Kenney Hedgpeth (1958–2011), co-founder of the International Society of Genetic Genealogy (all statements unverified). Statements reference a “Robert Hudspeth” of New Jersey, the only person with one of those names [close to New England]. All others of that surname were presumably still in England or the southern U.S. at the time Stillman Burr was born. Wow, that is really exciting. This is why I love this activity, you really never know what is around the corner. Jeff, sharing the same DNA would prove/disprove whether either of you is Stillman’s descendant. The 100% definitive test, of course, would be to get a provable sample of his DNA, either from a lock of hair or digging him up. My gut feeling, however, is that you and your new-found cousin are both “Burrs”, but should be looking at the possibility that Burr, Sr was Stillman’s step-father, not his birth father. I have at least two instances in my own tree where the birth dad abandoned the family when a son was a toddler, Mom remarried and the son grew up with the step-dad’s surname, never formally adopted but never told of Mom’s previous marriage that produced him. Another possibility is Stillman was illeg, and Burr was his mother’s maiden name. Have several instances of that in my tree, too, mostly in the Brit branches. Interesting that your brick wall is a Burr — my wall is my 3rd great grandmother, Hannah Burr, who married Lyman Covey. The Burrs are an elusive bunch! I have a very similar Brick Wall for my great-great-great-grandfather, Clement Drew born 6 Sept 1775 in Barnstead, NH. Between me and several others, we have been working on this for 25 plus years. Still no parents proven, and a granddaughter of him in the 1920s said that Clement’s father was also named Clement, but that was all she knew. 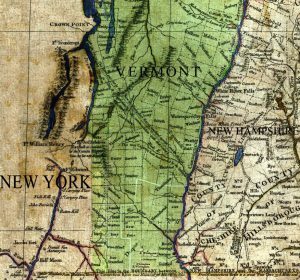 There were several men named Clement Drew in NH, VT, ME, and Quebec in the right years that I have tracked down, but even with some great deeds and other records, there is still the problem of “which” Clement Drew? I have several strong theories, but I may never figure it out. The documents I really need are non-existent for this time period. I, too, keep hoping for that hidden item. Thank you for the reminder to ‘think outside the box’ on our brick walls. I’d be interested in hearing more about the DNA evidence. The name Silliman is prominent in early Fairfield, Conn. and there was a famous bridge designer Burr in Chenango Co. NY. Looks like you have shared some “confusion” and I am anxious to hear about the results. Thanks Larry, I appreciate that. It’s a bit of an uneasy feeling when a whole branch of the tree feels like it may need a good trimming! A couple of comments of others reminded me that two of my grandchildren have Stillman ancestors from Upstate New York! In fact, this was another instance where Son was never told of Mom’s first marriage (which ended when the dad died in a freak accident) and grew up with his step-father’s surname. Took years to find their gr-gr-grandpa’s birth record, because nobody knew he was born a Stillman. Only came to light when a family member came across an old newspaper account of the birth father’s accident, which named the widow by her first name and the name of their son. Just checked the grandkids’ tree. Their ancestor’s birth name was Stuart Ormal STILLMAN, b. 1920 in Alma, Allegany Co, NY. After both parents died in an accident, he was adopted by a maternal aunt whose husband was a LUND, hence little Stuart became a Lund, too. Alas, my notes on his earlier STILLMANs haven’t been entered in the database, mostly because they were quite a prolific bunch who made it a habit of marrying their cousins of one degree or another. But the story handed down by the Lunds was that several generations of Stillman men before Stuart had also had the name “Ormal”, after a “famous horse” in the mid-1800s. There was, in fact, a race horse by that name around that time, but it wasn’t born until sevaral years *after* the first Ormal (or Ormel) Stillman was born, The racehorse story was helped along by the fact that the first Ormal was born near Belmont, NY, nowhere near the home of the Belmont Stakes hundreds of miles away. A prime example of the old saw that every family story contains a seed of truth if one simply looks for it. Jeff, I knew BURR sounded familiar. One of my CONN gr-gr aunts married an Alvin Sidney BURR, b. 26 July 1810 in Montgomery Co, NY. They were parents of eight children. Alvin was the son of Bissel Burr and Eunice ROBBINS. Bissell Burr (1771-1845) was no relation to me, so until now I had no reason to find out more about him. His people were the BURRs of Windsor, CT. Perhaps no relation to your Stillman, but someone else reading this might find this tidbit helpful. An otherwise overlooked solution is that one of your grandmothers was visiting a neighbor while dad was working. Annie you are too kind! Indeed, we are trying to figure this one out.